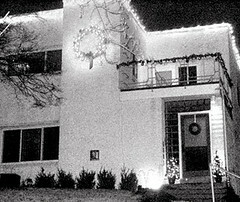 A Christmas image of the house taken in the rain. Because of its prominent location on a hill overlooking Chippewa, this house seems to be relatively well known around Saint Louis (at least among photographers and lovers of modern architecture). Photograph by Anna, December 2004.